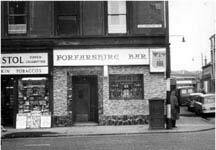 The Forfarshire Bar sat on the corner of Parliamentary Road and Killermont Street. This old pub was ideally situated near the Buchanan Street Bus Station. There has been a pub on this site since at least 1870s. Robert Anderson was landlord here in 1875, he also had pubs at 6-8 College Street and 161 West Nile Street. In 1881 John Watt acquired the licence, he was a well established spirit merchant in the city, having licensed premises in 30 College Street and 70 Cowcaddens, many will remember this old pub as Tommy Foley's Pop Inn. Mr Watt continued as licensee before WW1. William John Ross then took over the pub, he passed away in 1918, his wife Helen then got a transfer of the licence. Helen's son John took over the running of the business until the 1950s. 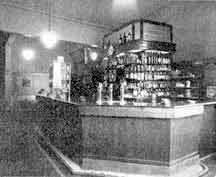 In 1939 John had the pub refurbished to keep the bar up to date with the rest of the pubs in the area. The pub had an increasing number of bus passengers among its clientele, a larger amount of visitors came to the district as a result of the bus station, which was the site of the old Buchanan Street railway station. Two plain unpanelled doors, one in Parliamentary Road and the other in Killermont Street, where the family department was. The exterior of the premises were painted in grained light oak with terrazo work at the entrance. The inside swing doors were of Japanese oak, and two of them at the main entrance had special air pressure springs a new addition to the pub and one of the first to be installed in Glasgow. Interior view of the main bar. 1939. A display window with concealed lighting and a neon sign gave a good effect in Killermont Street. The interior was well lit by two large windows which had an artistic and modernistic bottle and glass theme worked through them presenting a very attractive appearance. Artificial lighting was provided by a number of hanging octagonal electric lamps which matched the design of the gantry and bar. The gantry, semi-circular was finished in Australian walnut and with mellow concealed lighting displayed the various drinks available, behind this was Mr Ross's office. In the centre of the gantry was a modern electric clock. The bar counter was the same shape as the gantry with a mahogany top and Japanese oak finish. Monel metal bar pipe fittings with two sets of three chrome plated taps were fitted to the bar. A small display cabinet on the counter exhibited the various liqueurs. To the right of the counter was a small electric cooker for hot snacks. The walls were panelled half way up in Japanese oak, with a red band at the top. Above this was painted cream, while the ceiling was papered in anaglypta. The saloon had glass topped tables and oak chairs. A modern electric fireplace was installed on one side with electric tubular heaters, which lined the bottom of the walls provided warmth during winter months. A small sitting room with an arched doorway was situated to the left of the main saloon. Seats covered with red Rexine leather line the walls on either side. Small tables and chairs similar to those in the main saloon were provided. The floor was covered with red designed linoleum. There were two architects involved in the construction of the new bar, William Reid and John Boyd. 1970-1960 James A D McLean Smith. 1950-1937 William John Ross jun.